Applauded for style, sturdiness, functionality and the unique filling system, Conklin pens have always been admired by pen enthusiasts. With their out worldly innovations and refined expertise, they have created a wide range of writing instruments for different type of pen users. A recent addition in Conklin's line-up of exquisite writing instruments is the new "Conklin Matte Carbon Stealth Series". Hand turned in Florence, Italy; the new Conklin Matte Carbon Stealth Series is a marvel in itself. This beautiful series takes its design from the legendary Demonstrator Crescent Series and Conklin Mark Twain Crescent Filler Series. Characterized by its featherlike carbon fiber body, the pen offers a balanced writing experience and keeps you away from hand fatigues and cramps. 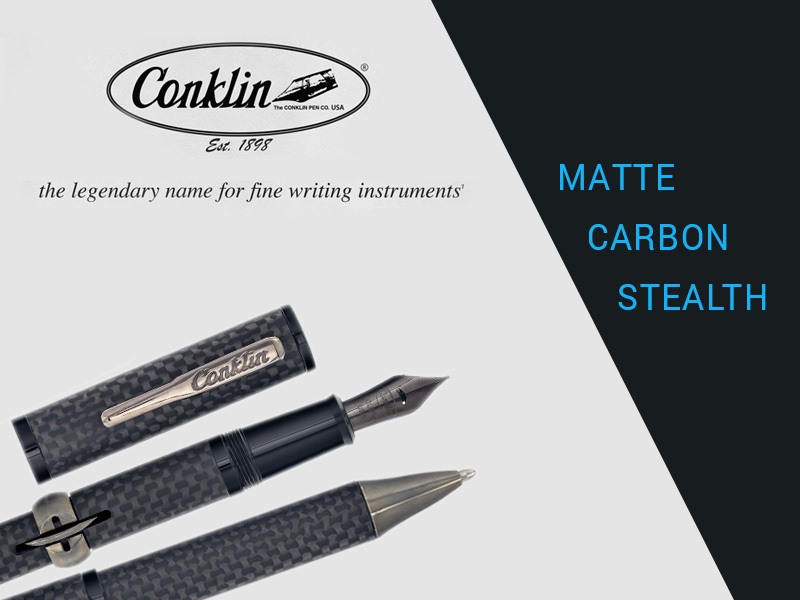 The Conklin Matte Carbon Stealth Series is available in two different writing modes i.e. fountain and ballpoint version. The fountain pen version is equipped with Conklin's traditional crescent filling mechanism. This easy filling system allows you to fill your fountain pens without opening the barrel time after time. The Conklin Matte Carbon Stealth Fountain Pen comes with a variety of nib options. The first one on the line and probably the most popular is the T-Flex steel nib. The nib offers vivid line variations depending upon the pressure of stroke. Press it gently and it writes like a premium fine point, apply a bit of pressure and the nib automatically transforms into a broad point. Overall, the T-Flex nib is all in one type of nib and offers the functionality of different points via one single nib. Second option is the unique cushion point black steel nib. The appearance of the nib gels pretty nicely with the design of the pen, and provides the pen a full black color tone. The cushion point nib is available in fine, medium, broad and 1.1mm stub. Third and the most expensive choice is the 14KT gold nib. Like other gold alloy nibs, this sturdy nib also writes perfectly and provides consistent ink flow whenever pressed against a piece of paper. The 14kt gold nib is available in fine, medium and Italic. Over the course of time Conklin pens have acquired their reputation through their innovative product and step-ahead creativity. Today, Conklin pens are preferred by many pen enthusiasts for their undisputed qualities. Like other members of Conklin family, the new Conklin Matte Carbon Stealth is also strong pen and will last for generations if handled properly. The unique flair of this Italian writer manifests the traditional design which once made Conklin so famous. With the new Conklin Matte Carbon Stealth series, Conklin have modified their traditional design with a dash of modernism and delivered a writing tool for the new age.